The Federal Funds rate is the interest rate on overnight loans between banks. These loans are most often used to satisfy the reserve requirement. The federal funds rate is the interest rate at which a depository institution lends immediately available funds (balances at the Federal Reserve) to another depository institution overnight. The rate may vary from depository institution to depository institution and from day to day. 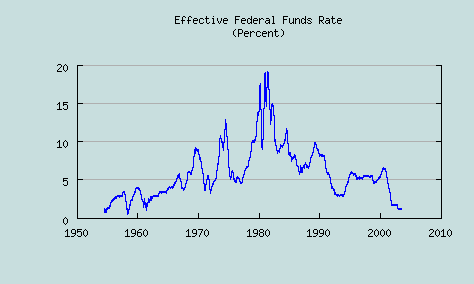 Why does the Fed increase or decrease the federal funds rate? The Federal Reserve Act specifies that the FOMC should seek "to promote effectively the goals of maximum employment, stable prices, and moderate long-term interest rates." At each meeting, the FOMC closely examines a number of indicators of current and prospective economic developments. Then, cognizant that its actions affect economic activity with a lag, it must decide whether to alter the federal funds rate. A decrease in the federal funds interest rate stimulates economic growth, but an excessively high level of economic activity can cause inflation pressures to build to a point that ultimately undermines the sustainability of an economic expansion. An increase in the federal funds interest rate will curb economic growth and help contain inflation pressures, and thus can promote the sustainability of an economic expansion, but too large an increase could retard economic growth too much. The Committee's actions on interest rates are undertaken to achieve the maximum rate of economic growth consistent with price stability and moderate long-term interest rates.